Crochet headbands are simple and quick projects to work on. 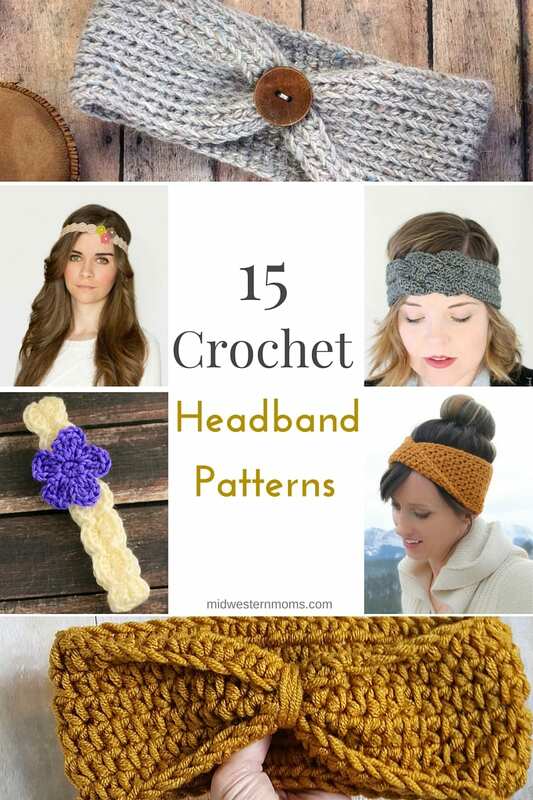 I have collected 15 free crochet headband patterns that are on my list to create. Crochet Headband Pattern – Midwestern Mom – Simple and versatile, this crochet headband pattern can be used with multiple sizes. It’s also topped with a simple flower; great for crochet beginners! Crochet Heart Headband Pattern – Midwestern Moms – This headband is the sweetest little headband ever! This string of hearts would be lovely for newborn photo shoots (but can be made in different sizes as well). Crochet Shamrock Headband Pattern – Midwestern Moms – This headband is perfect for celebrating St. Patrick’s Day! Crochet Pokemon Headband Pattern – Midwestern Moms – Know a Pokemon fan? This PokeBall headband is perfect for them! Free Crochet Headband Pattern (Baby-Adult Sizes) – Make & Do Crew – This crochet pattern is simple to make in under an hour – fantastic for a last-minute gift! Its middle is topped with a button for an adorable chic look great for all ages! Sailor Knot Crochet Headband Pattern – Crafts Unleashed – Made from one color of yarn, this crocheted headband is dimensioned with a thick sailor knot on the front – perfect for a trendy but minimalist look. Golden Fave Twist Headband- Free Crochet Pattern – Mama In A Stitch – Since this headband is reversible, it can be “twisted” – making this a trendy hair accessory you can wear two ways. Elegant Floral Headband From Red Heart – Stitch & Unwind – This crocheted headband is light, small, and great for spring. Rather than the chunky fall/winter combination, this floral piece is boho-chic inspired! Knotted headband Crochet Pattern – Rescued Paw Designs – In this beginner tutorial, this crocheted headband has a small knot in the front; for a minimalist but elegant twist to a regular headband. Simple Chevron Headband – Whistle & Ivy – Made with two different colors of knit, this chevron headband is great for a strong statement headpiece. Tutorials/patterns are included for baby, toddler, and adult sizes. Scalloped Lace Heirloom Headband – Kristens Knits – This baby headband has a feminine feel. It’s scalloped patterns are great for ages 0-6 months; but it is still a basic enough tutorial for beginner’s to pick up quickly and experiment with. Crochet Braided Headband (Tutorial) – Hello Yellow Yarn – In a braided twist, this dual-colored headband can be made for both children and adults. Despite it’s look, the actual strands are incredibly simple to make with this step by step tutorial. A Free Crochet Headband Pattern – Cre8ation Crochet – With many spaces in between, this headband is best for warmer weather. However, modifications are given if you’re looking for a warm headpiece! Bloomswirl Headband Crochet Pattern – Hopeful Honey – Boho inspired, three tiny flowers in three bright colors compliment this crocheted headband. Granny Stripe Headband/Earwarmer – Tangled Happy – Simple but cozy, this headband is topped with a big, gorgeous flower. It’s thick dimensions are a hip way to stay warm during the winter! Free Crochet Latte Headband Pattern – Expression Fiber Art – Inspired by the creams and browns of latte, this adult headband is chic, eye catching, and simply gorgeous! Crochet Headband Pattern – Bread & With It – Great for young babies, this crochet headband is small and not very wide; making it a nice touch to a messy hair day, without being too hot for your little one! It also comes with an additional crochet flower tutorial, which can fix nicely on top of your headband! Which crochet headband pattern is your favorite? You’re Welcome! Glad you like it! Thanks for stopping by! Hi there I am new to pinterest how can I get this pattern? I tried clicking the photo. Thank you. This is a list of patterns. You will have to click the link to whichever pattern you want. Not all will have printable patterns. Some will just be viewable on the internet.